Along with the scent of apple ciders, pumpkin coffees, and comfy sweaters we have to look forward to this fall, there’s more One Direction music coming our way! Today, the quintet announced their fourth album, titled ‘FOUR’ will be out November 17th. Along with that, the boys had another surprise, a free download! 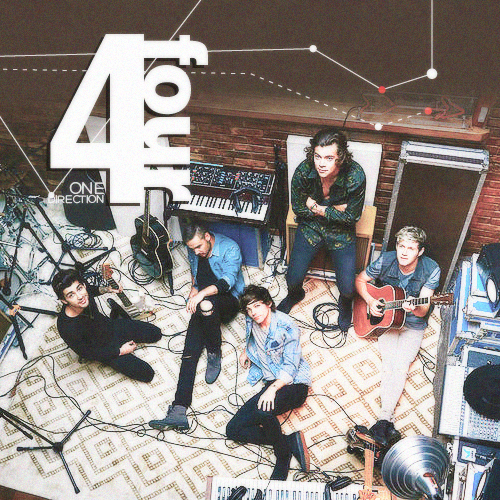 Their new song, “Fireproof”, can be downloaded for free here for the next 24 hours. Now, we all know what to expect from 1D these days; ultra bubblegum pop beat, alternating taking turns singing with every verse, and Zayn belting a run during the final chorus. So naturally when this song was announced, we all had our assumptions of what it would sound like before we pressed play, but all of those thoughts went out the window the second that smooth guitar riff started. Even if One Direction themselves told you personally “Fireproof” was their new song, let alone two of them wrote it, you wouldn’t believe them. Its sound is so different from all of their other singles, having more of an indie/rock influence rather than bubblegum pop. “Fireproof” is warm, mellow, and smoother than honey. There is no strain in any of their voices to hit crazy high notes, no heavily produced layered instrumental enough to make your head spin. One of the great things about “Fireproof” is that its just a small taste of what this new album will sound like. Harry, Liam, Louis, Niall, and Zayn have done more writing for this album than any of the previous ones, where they will be joined on the credits by some song writing geniuses like Ed Sheeran and OneRepublic’s Ryan Tedder. With this song, One Direction are moving towards a more mature sound along with some influence of their own personal music preferences. This is their second to last album in the five album contract with Modest! Management, but the boys say they will be making music for much longer than that. Hopefully with this new sound of their’s, they will be!